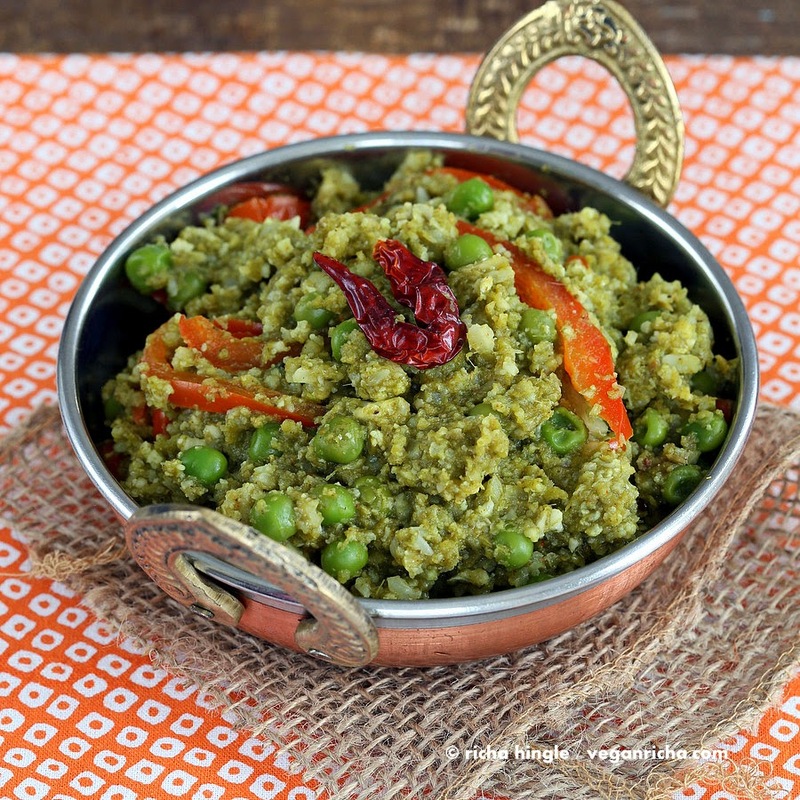 Gobi Mutter Keema is a flavorful curry made with minced cauliflower and peas in a cilantro and onion gravy. A vegan, glutenfree recipe. Back to regular programming after all the awesome snacking. 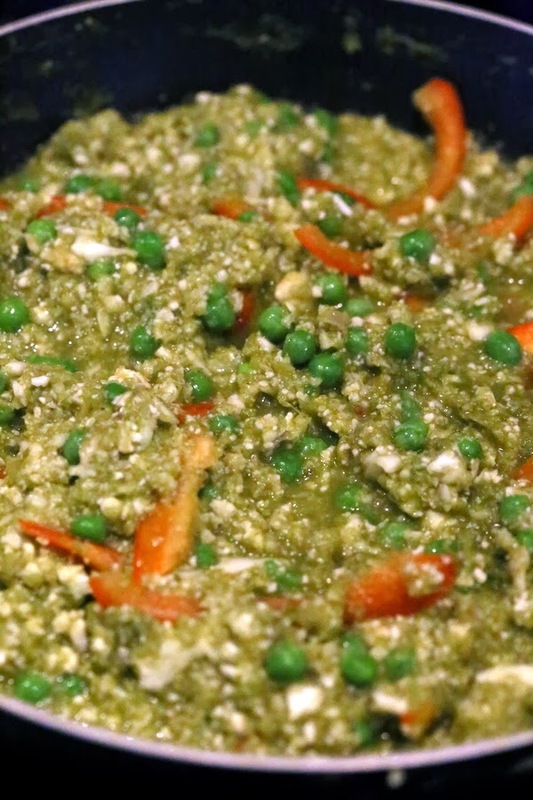 Make This fantastic Keema curry. Keema means minced meat and any Indian keema curry has some or the other meat in minced form. But you know what, the taste that everyone likes in the the meaty curries is usually not the meat, it is all the spices, herbs, the curry and way of preparation. Put anything else in the curry and it pretty much tastes as delicious! Cauliflower comes to the rescue again today. Grated up and added to the delicious cilantro based curry. If you are not a big fan of cilantro, you can substitute a good portion of it with any greens of choice like spinach. Crumbled up Tempeh would work beautifully in this curry too, especially to give the dish a more toothy and textured result. Palak/Saag Tofu – Tofu “Paneer” in Spinach curry. Blend up the cilantro, onion and spices and cook on medium heat. Once the cilantro onion mixture is fairly dry, add the red peppers and cauliflower to it. Mix and cook for 2 minutes. add water or almond milk and salt. Mix and cook covered until the cauliflower is cooked. Serve hot with flat breads, rice or grains or top a salad. 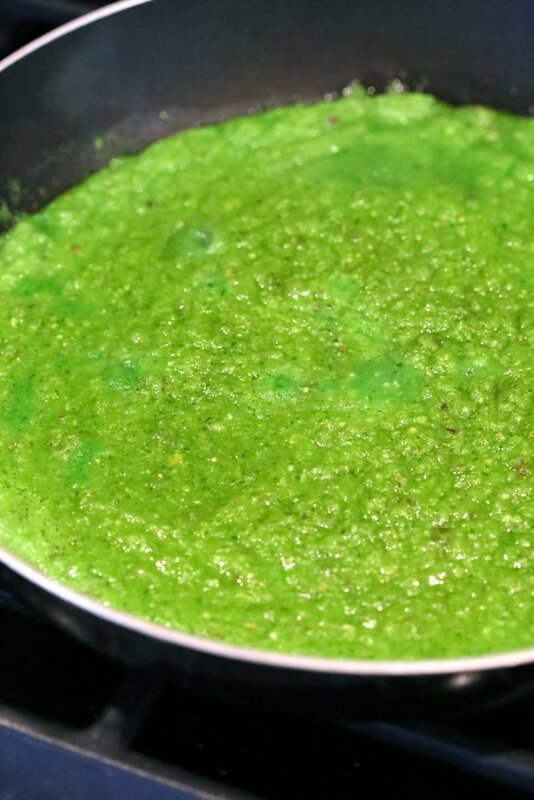 Blend the onion, cilantro, chili, spices into a smooth puree(use 1/2 cup or more water). In a pan, add a teaspoon of oil and heat on medium heat. Add the puree and cook uncovered for 15-18 minutes or until it gets dry and clumpy. Reduce heat to low-medium after 10 minutes. Stir occasionally to avoid burning. 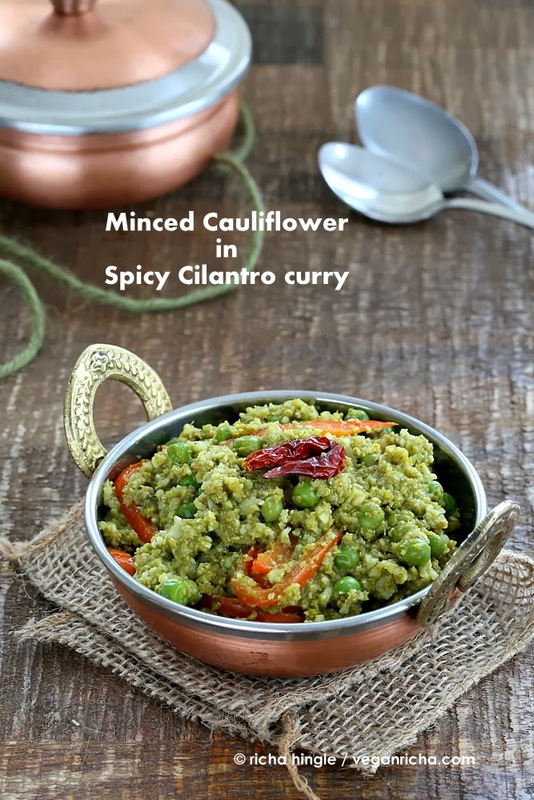 Meanwhile, chop up the cauliflower and rice(chop) it in a blender or food processor or grate. Slice the red bell peppers and other veggies if adding. Add the grated cauliflower and red bell pepper to the dry onion cilantro curry. Mix well to evenly distribute and cook for 2 minutes on medium heat. Add peas and a 1/2 cup of water(add almond milk for creamier version), lemon juice and salt. Cover and cook for 6-8 minutes. Mix and adjust salt and spice/cayenne. Cook uncovered to dry the curry a bit to preference or until the cauliflower is tender to preference. 3-5 minutes. Serve hot with Naan/flatbread or rice or grains or fill up tacos or lettuce leaves. Notes: to make the curry with Tempeh, cook a loaded cup of cubed Tempeh in 1/2 cup water, 1/4 tsp salt and 1/2 tsp garam masala at medium heat for 10 minutes. Drain the water if left. Crumble the Tempeh and add to the curry when you would add cauliflower. Variations: dry roast the whole spices(fennel and cumin seeds and black peppercorns) in a pan for a minute on medium heat until the fennel seeds change color, and then add to blender. « Baked Mango Sriracha Cauliflower Wings and 16 Vegan Superbowl Recipes! This recipe looks amazing…all the recipes you create shows how creative you are, absolutely admire you for working so hard putting,your blogs together for us,viewers. I really find it hard to manage my family life and have food,on the table three,times a day..how do you do it so innovatively?? i love how green this is- it would be perfect for saint patrick’s day! 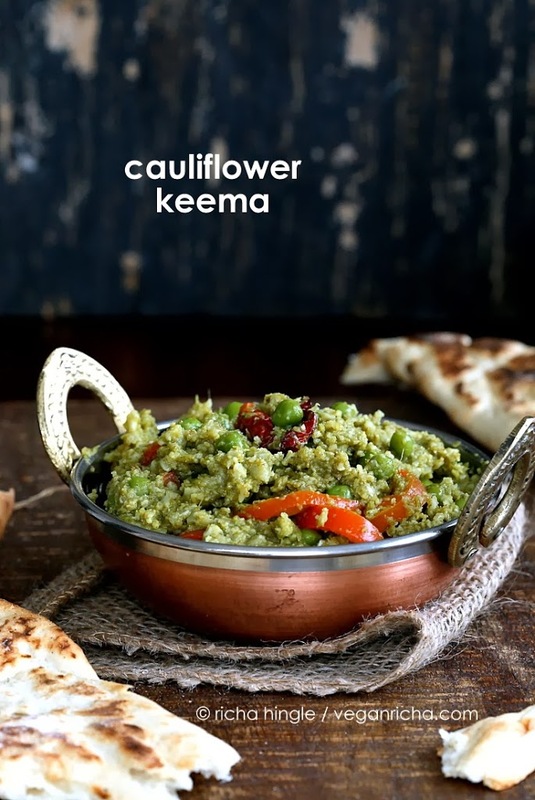 you never run out of ways to use cauliflower, and this looks delicious! This looks so good! And isn’t it true of so many meals, that the meat is not actually the part that people crave? I feel like if we could just get more people to try plant based meals every once and a while, they’d be hooked! 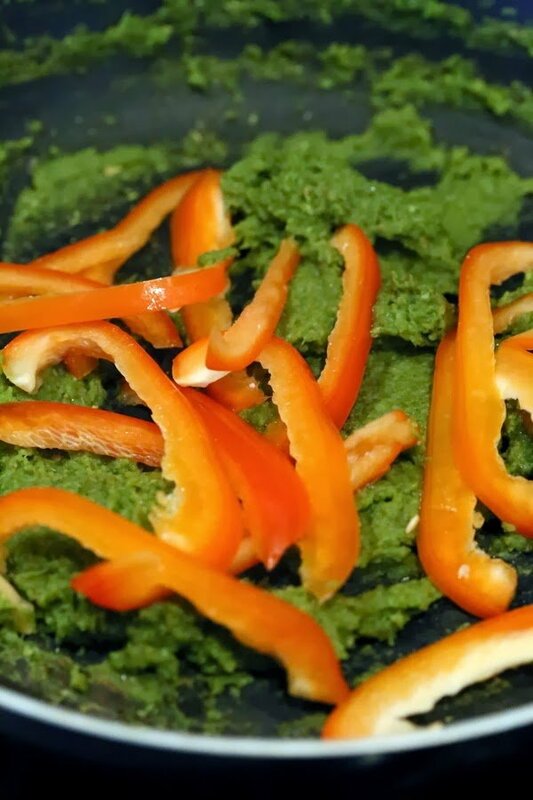 Blend the onion, cilantro, chili, spices into a smooth puree(use 1/2 cup or more water). Just want to verify that I need to add the water when blending the above ingredients? Yes, add the water during blending. 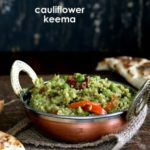 Love cauliflower and this is a very different recipe. Superb actually! The texture of this dish is so interesting – and the color – gorgeous! the game was indeed pretty interesting, I am happy about the win though. love the idea of cilantro sauce..looks delicious. Ricing is a method of chopping as to make small like rice. There is no actual rice in this step. 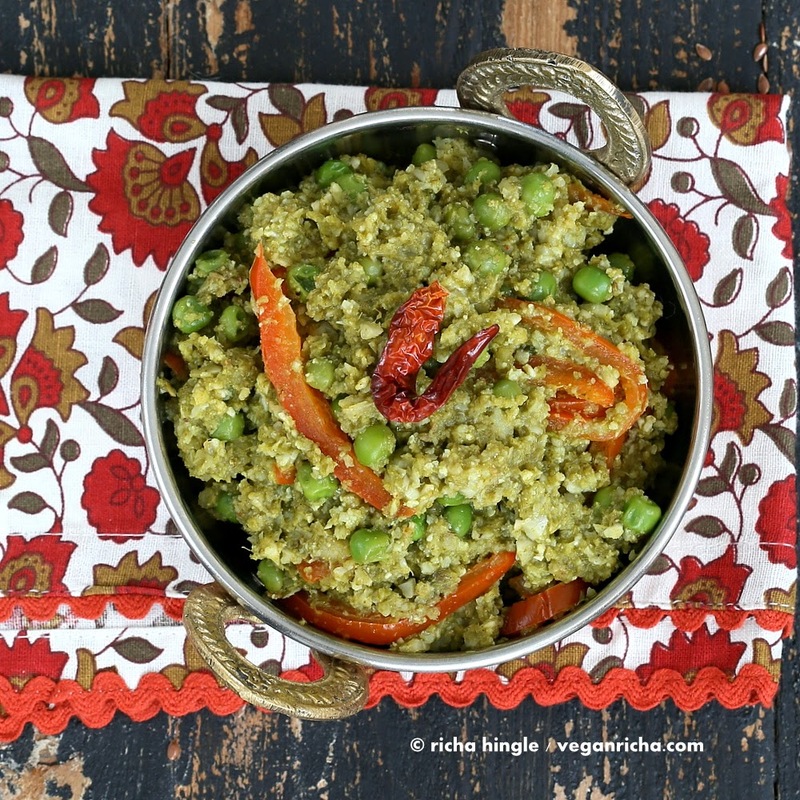 Hey Richa, read this recipe this morning on FB and immediately cooked it for my dinner. Very nice flavours indeed. Just wondering whether you thing it would be a good idea to roast spices prior to blending? I may consider it next time. This was quick to make, required few dishes, and turned out so delicious. Perfect. I folded in baby kale/chard/spinach at the end. Many thanks for the amazing recipes! I’ll be trying this next, I’ve just made the vege jalfrezi and it was awesome! thanks for the great recipes, its making the detox a little easier! Thank u. I need to learn how to cook Indian food. This recipe was very straightforward, and did not take me much time (although I recommend prepping ingredients and working in stages if you have a one year-old running around!). I goofed somewhere, though, and I am guessing that it was the giant head of cauliflower. The head I used was rather large and it seemed like the sauce wasn’t able to cover it all, which made the dish lack flavor. However, I added a dollop of greek yogurt and naan, so it was just fine! I am looking forward to trying this recipe again, especially to use the sauce with tofu for me, chicken for my husband, etc. Sauce was delicious! I always love your recipes. Yes, it could be the amount of cauliflower and the sauce which is also dependent on several factors. When you add cauliflower or tofu or any other veggie, add half the quantity and mix in. Add more veggies a bit at a time and mix in so you can see if the sauce is able to mix and cover or not and stop when it seems like there is a good balance. You can also add a bit more garam masala and salt to add flavor the dish if the sauce wasnt enough. So glad you love the sauce! This recipe was so good and also very forgiving. I made it last night and didn’t even realize that I mistakenly used the whole head of cauliflower. I used an almond-coconut milk blend and that made it nice and creamy. Even my 17 yr old, who loves to complain about my veggie dishes, liked it. In fact, he liked it so much that he thought we should take some to his girlfriend’s mom! (she is Indian) I used a red chili from my garden which added enough heat that we didn’t need any cayenne. I also accidentally dumped in way too much cardamom, but it still turned out great. I’m looking forward to trying more of your recipes! yay! so glad it turned out so well! Most Indian recipes are flexible and they can all be adjusted at any time during cooking or after, add more spices and more sauce if too much of the veggies and so on. This recipe looks great! Making it for dinner tonight 🙂 just wondernig though, when you say “1 cup packed cilantro”, do you mean 1 cup packed with chopped cilantro? Or just pulled leaves? I don’t want to end up putting in more cilantro than the recipe intends haha Thanks!